Kerry Says He Regrets Treatment Of Indian Diplomat In New York : The Two-Way The secretary of state told a top official in New Delhi that a row over the strip-search of a U.S.-based Indian female diplomat should not come between the two countries. 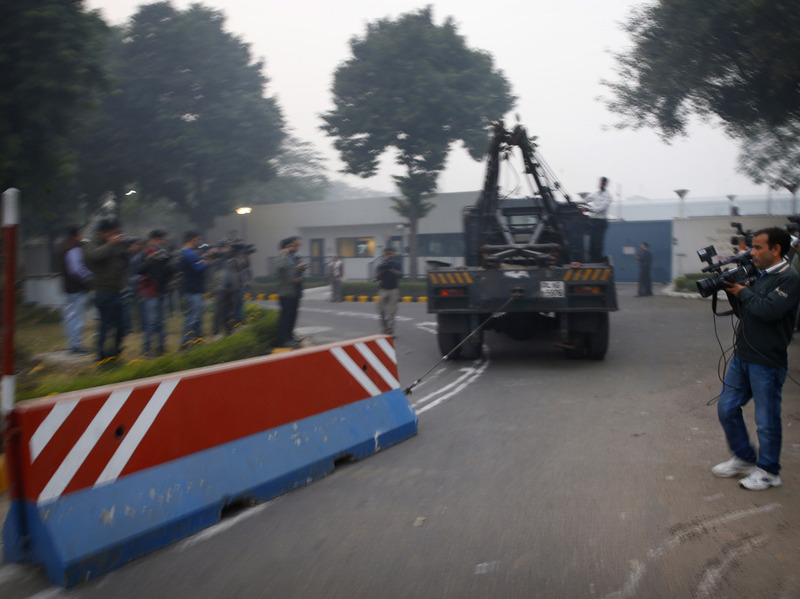 Indian workers in New Delhi remove a barricade Tuesday that had been erected outside the main entrance of the U.S Embassy as a safety measure. Secretary of State John Kerry has telephoned a top official in New Delhi to express regret for the strip-search of an Indian diplomat after her arrest last week in New York on charges of visa fraud. "As a father of two daughters about the same age as [Indian diplomat] Devyani Khobragade, the Secretary empathizes with the sensitivities we are hearing from India about the events that unfolded after Ms. Khobragade's arrest," State Department spokeswoman Marie Harf said in a written statement, relating Kerry's conversation. "In his conversation with National Security Advisor [Shivshankar] Menon, he expressed his regret, as well as his concern that we not allow this unfortunate public issue to hurt our close and vital relationship with India," Harf added. Menon had called the Khobragade's treatment "despicable and barbaric." As NPR's Krishnadev Calamur reported on Tuesday, the 39-year-old Indian diplomat is accused of using false documents to get a work visa for her Manhattan housekeeper. Reaction in India has been harsh, and the Indian government even removed concrete barriers near the U.S. Embassy in New Delhi in an apparent signal of its unhappiness over the situation. India has also withdrawn all airport passes and halted import clearances for the U.S. Embassy. Australian Network News, quoting Indian media, reported that New Delhi had transferred Khobragade to the United Nations Permanent Mission in New York on Wednesday in a bid to grant her full diplomatic immunity. India's Foreign Ministry has yet to confirm the reports, however.